Today I bring you a nice, but quick to make project. I call it a Twisted Metal pendant. It is made using Makin's Clay. I am fond of using stamps and mark making tools to make pendants, I also enjoy free style sculpting as well. This pendant literally took 20 minutes to make. Run the clay through the pasta machine to the third thickest setting, cut a long rectangle shape. Mine measures 1.5 inches in width and about 6 inches in length. Slightly bend the clay in half, don't make a seam or hard edge; instead, keep it rounded. Then take different sections and twisted in any directions and glue the ends. Let the clay cure for 24 hours, I then rubbed on metallic Silver Gilder's Paste Wax, it gives it a nice color and protects the clay. You can poke hole for the bail or in my case I made a wire wrapped bail. Voila! you're done and now you have a stylish pendant. 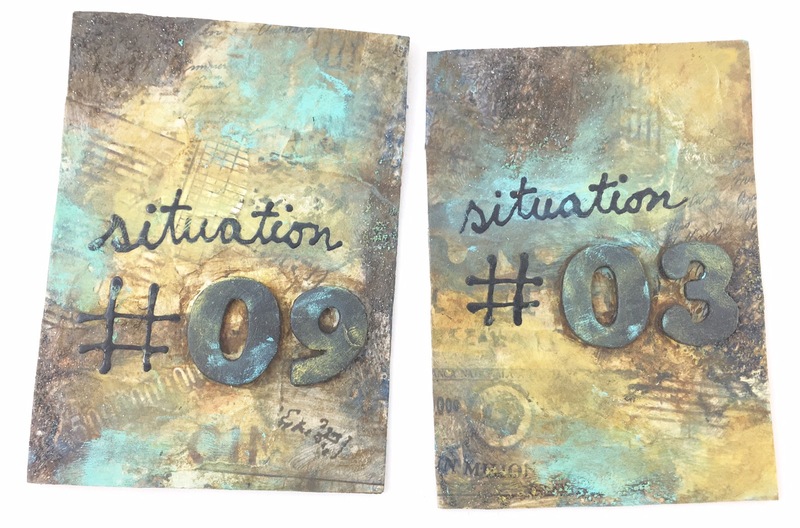 Be sure to visit the Makin's Clay blog for more project ideas. 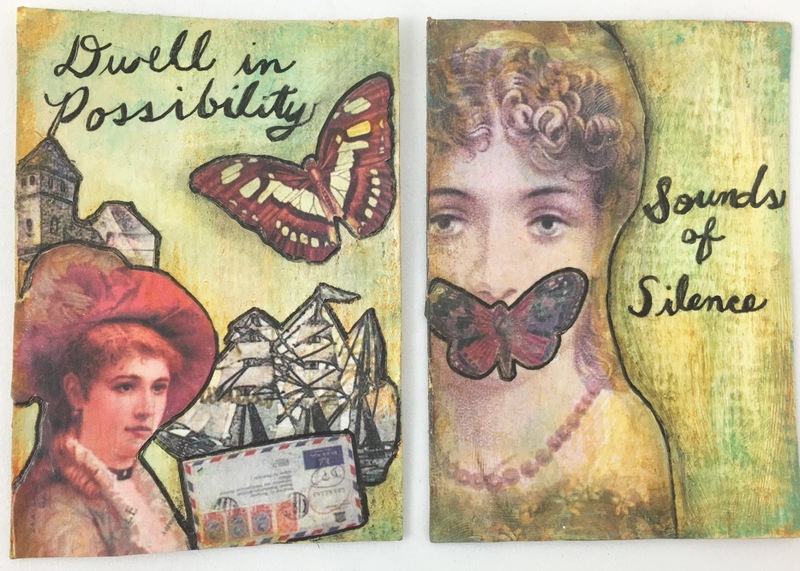 For the last four weeks I have participating I have been Mixed Up Magazine Mixer Artist Trading Card (ATC) prompts challenge. This is Facebook group where we share our creations. About a month ago they started weekly ATC themed prompts. This effort will be for one year. 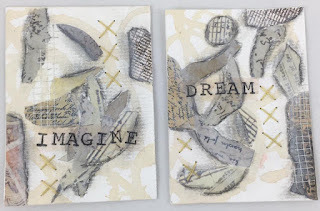 I will try to follow the weekly prompt make my ATCs and post four weeks of ATCs at a time on my blog. It's neat little way to stay in a creative flow by making small, quick pieces of art. So here it goes. 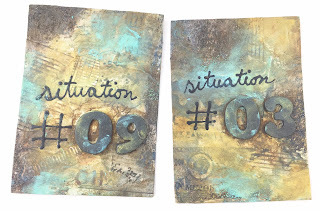 Week 1 - Make Some with newly purchased art supply. At the time I had just purchase watercolor and been experimenting with it, turns out, I like it. Will post other watercolor creations as well. I made coffee ring, which I used as my background then created this abstract pieces. I used color chipboard die cuts and created this abstract piece. Really I had no idea what to make. 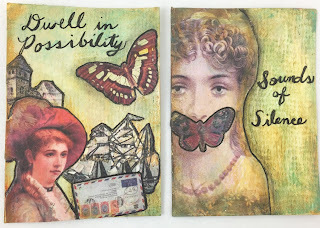 On one of my ATCs, I used my favorite poem and quote of all time is from Emily Dickinson's 'I Dwell in Possibility'. On the other ATC, I used my favorite song from the band Disturbed 'Sounds of Silence'; an original Simon and Garfunkel song. Today I bring you a tiny bit of happiness, in a box, that is. I've had this small happy face stamp for while now. I purchased it with no project in mind, just liked it. 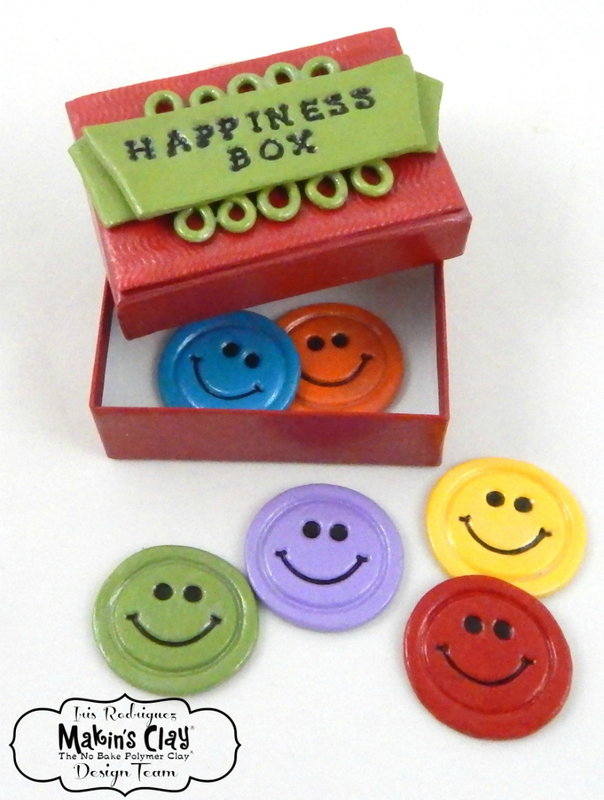 Recently, while looking for a stamp, I saw it and got the inspiration to make this Happiness Box. Imagine getting, this box and think, hmm....okay, this is a silly little box. Really, you don't know what to expect. Then you open it to find happy faces...your reaction. Ha! ha! See it already made you smile. I made my box using a simple jewelry box, Makin's Clay® and acrylic paint. Check out the Makin's Clay® Blog to get detailed instructions for making this cute Happiness Box. Then go spread happiness.